OWS goons discovered today that their newest grand scheme to wreak havoc and chaos on 11 West Coast ports from San Diego to British Columbia wasn’t sticking it to the man, after all. The Alameda County Building and Construction Trades Council’s secretary-treasurer, Andreas Cluver, said many of his union’s workers were recently hired at port building projects after long stretches on unemployment. Given that, a port shutdown aimed at punishing the 1 percent “makes no sense,” he said. He said no union at the port supports the shutdown. Michele Horaney of Alameda, who helped place an advertisement in The Chronicle last week pushing “99 percent” reform measures including “taxing wealth more and labor less,” said she views the split as emblematic of Occupy’s growing pains. A house divided…Goons vs. Thugs. 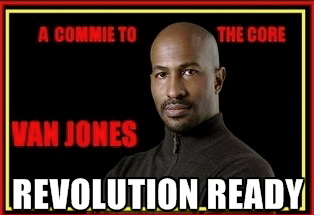 Somebody at the White House needs to check with Van Jones and tell him to get his protests straight. It’s hurting the campaign.